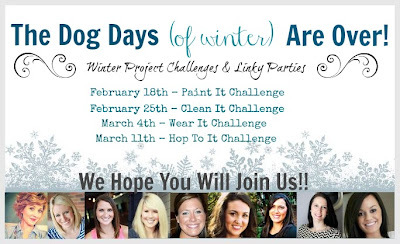 Welcome to the final week of the Dog Days (of Winter) Are Over Project Challenge! This week we're challenging you to "Hop To It" and share with us your favorite Easter recipes, activities or traditions. Some of you may have seen this post before as it's been pulled from the ILYMTC archives on one or two occasions since it was first published this time last year but as one of my most favorite family traditions, I had to share it again. 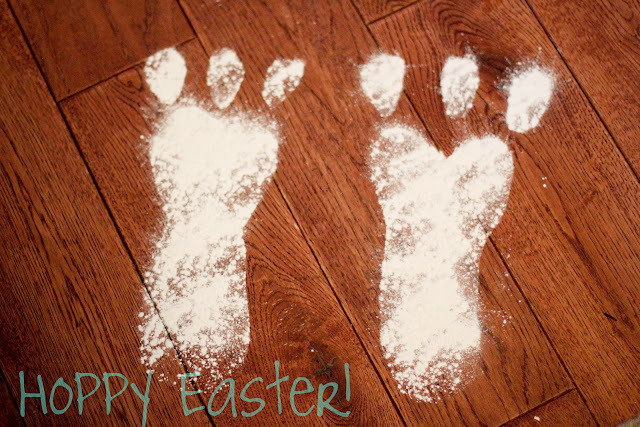 For as long as I could remember, the first thing to greet me and my brother Easter morning was the white, powdery bunny prints scattered throughout the first floor of home, proof that the Easter Bunny himself had paid a visit to our house and left behind a sweet treat (or two!). The prints would often start at the front door, lead past the plate that held yummy carrots for our bunny visitor, dance across the entryway, into the living room and end right at that special spot that held our overflowing Easter baskets. How did the Easter Bunny get powder all over his feet, you may ask? From the "trap" or small pile of powder that we would set directly in front of the door to our house. For years I begged and pleaded with my parents, hoping they would share their secret with me and it wasn't until I had a baby of my own that they finally let me in on just how they pulled off those perfect, powdery prints. Because those prints hold such a special place in my heart, I couldn't help but share them with you and hope that they, too, can become a staple in your Easter celebrations. 1. Freehand or trace your bunny print onto the oak tag. 2. 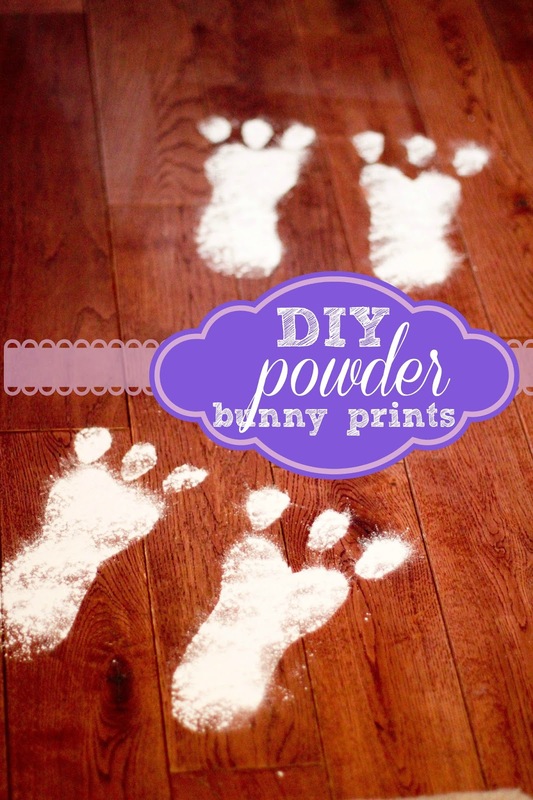 Using your scissors, carefully cut our your prints leaving the perfect bunny print template. 3. Decide the path that your Bunny will take throughout your house. 4. Carefully construct your path by placing down your template and shaking the baby power into the stencil to form the prints. I never said this wouldn't be messy but I can promise you that the priceless look on your kids' faces will make up for the mess ten-fold. When all is said and done, the prints can be cleared away with a damp rag and vacuum. This idea can also be applied to leprechauns for St. Patrick's Day and Santa for Christmas! Although it's a quick and easy project that doesn't call for many supplies, the memories it creates are priceless and I look forward each year to doing this for my boys! 1. Please stick to this weeks theme & only link up Easter-related related posts. 2. Feel free to link up old and/or new posts! 3. Please use the image below in your post or include a text link back to the blog where you linked up. 4. Party Hop!! Please visit a few of the links & leave them some comment love! 5. We will be sharing some of our favorites on our Pinterest board. Be sure to follow it HERE. I'm linking up on Monday - can't wait! Ps - long story, but I'm not going to be able to go to Blissdom afterall! SO SAD!!!! So, just pretend I'm there in spirit and have an extra cocktail or 4 on my behalf. Deal? How cute! I need to start archiving all these posts for when I have kiddos. This is about the cutest thing I've ever seen: I love it! We do this every Easter, too! I think my 8 year old is going to catch on soon, though!